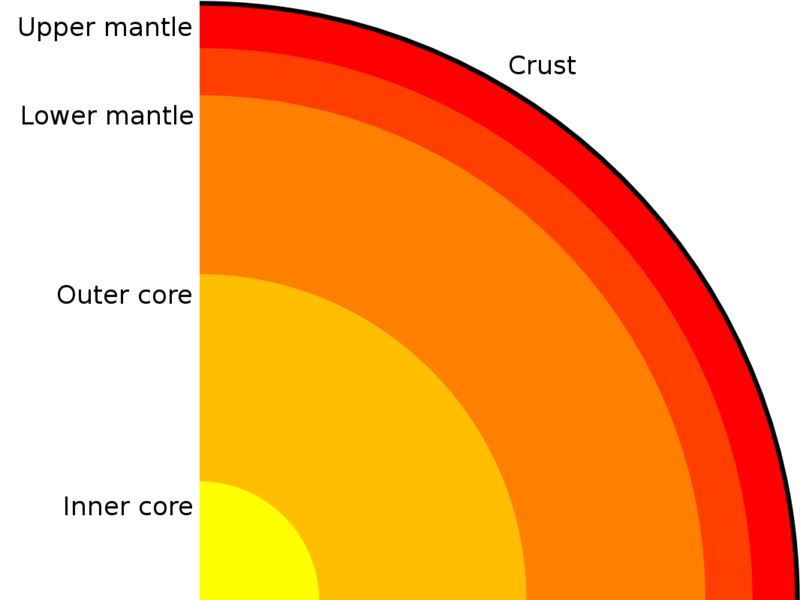 The main layers of the Earth are the core, the mantle and the crust. The differentiation of the layers was an important step in the history of the Earth, because the convection currents in the mantle are maintaining the volcanic activity and continental movements, while currents in the iron-nickel core are forming the Earth’s protective magnetic field. The volcanic activity, in turn, has been very important both for the origin of the life and for the maintanance of the stable climate conditions. Heavier elements such as iron and nickel sink towards the centre to form the core of the Earth. About 35% of the mass of the Earth is iron, and most of it is in the core. The condensing of elements cause the pressure to increase, which lead to the separation of the cores: the innermost section, under the greatest pressure (13 000 kg/m3), forms the inner solid core. The liquid outer iron core forms around it. The solidity of the inner core has been confirmed with seismic measurements. The outer core starts at a depth of about 2 900 kilometres, the inner core starts at a depth of about 5 200 kilometres, and the whole radius of the Earth is 6365 km. During differentiation, the lighter elements such as silicon, oxygen, aluminium and potassium stay in place or started to rise. These elements, and the minerals that are formed from them, are called silicates. Some silicates form chemical bonds with heavier elements, such as thorium and uranium, which prevent these from sinking into the core during differentiation. Also the high pressure prevailing in the core causes some of the elements to stay in the upper parts of the Earth, as they ’prefer’ less dense environments. The mantle forms from the elements in the upper parts of the Earth. The mantle is divided into the upper and lower mantles. The upper mantle starts under the Earth’s crust, from the so-called Mohorovičić discontinuity, and goes down to about 670 kilometres. The boundary between the upper and lower mantle is not fixed, but the lower mantle is considered to start from a depth of 400 – 670 kilometres, continuing until the core boundary, at 2 900 kilometres.